–The Great Buster: A Celebration at The Music Hall Loft (7:00 – 8:45). 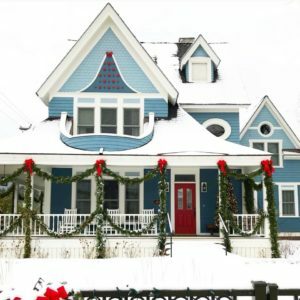 –Holiday Open House at Let’s Glow (5:00 – 8:00). –Holiday Pop Up at Seacoast Sports Clubs West End (5:00). –Local History Talk: The Adams Family at The Portsmouth Public Library (7:00 – 8:30). –Pete Peterson at Springhill Tavern (8:00 – 11:00). –Ugly Sweater Ornament Contest at Firefly Pottery (10:00 – 8:00). –Catapult Holiday Party at Sheraton Portsmouth Harborside Hotel (6:00 – 8:00). –Elf The Musical at The Music Hall (2:00, 7:30). –Long Story Short: Family Ties at 3S Artspace (7:00 – 9:00). –Drop-In Ukelele Circle Jam at Stoneface Brewing Co. (7:00 – 8:00). –Local Solutions Holiday Party at Great Rhythm Brewing Co. (6:00 – 8:00). –The Glenn Wixson Family Holiday Extravaganza at The Press Room (6:00 – 9:00). –28th Annual Gingerbread Show at Discover Portsmouth (9:30 – 5:00). –Mad Haus Holiday Edition at Seacoast Rep (8:00 – 11:00). –Film: Die Hard at Portsmouth Public Library (6:30 – 8:30). –Sabrina Benaim at Portsmouth Book & Bar (7:00 – 10:00). –Herbal Alchemy at Deadwick’s Ethereal Emporium (6:00). –Holiday Floral Workshop at 250 Market (7:00 – 9:00). –Jazz Jam at Profile Coffee Bar (7:00 – 9:30). –Jonathan Blakeslee & The Band of Fronds on WSCA Radio (9:00 – 10:00). –Barbara London at Rudi’s Portsmouth (7:00 – 10:00). –Spinning Generosity at LizFit (9:00 – 9:45). –Local Music at 3S Artspace (8:00 – 11:00). –The WSCA Holiday Party at WSCA Radio (7:00 – 9:00). –Miracle on 34th Street: A Live Musical at the Historic Town Hall Theatre (1:00 – 3:00). –Erin Costelo at The Press Room (9:00 – 12:00). –Annie at Seacoast Rep (2:00, 8:00). –Winter Farmer’s Market at Wentworth Greenhouses (10:00 – 2:00). –Gingerbread Cookie Decorating at Churchill’s Garden Center (2:00 – 3:00). –An Evening with Cellist Mike Block at The Dance Hall Kittery (7:00 – 8:30). –The Sugarbabies at Latchkey (9:00 -12:30). –Christmas Caroling with AIR at Strawbery Banke (5:00 – 7:00). –Kittery Winter Farmer’s Market at Kittery Community Center (10:00 – 2:00). –PMAC Jazz Institute Fall Concert at The Press Room (1:00 – 2:00). –Sunday Night Jazz: Swingin’ for the Holidays at The Press Room (6:00).